Republican Sen. John Kennedy (La.) invited a member of the Senate custodial staff, Calvin Franklin, as his guest to attend President Donald Trump's first formal State of the Union address on Tuesday night. "I am proud to take Calvin as my guest to the State of the Union. He works hard behind the scenes at the U.S. Senate and deserves a front row seat to history unfolding," Kennedy said in a statement shortly before the speech. "I'm excited that he will be able to enjoy this moment and look forward to hearing what he thinks about the experience." 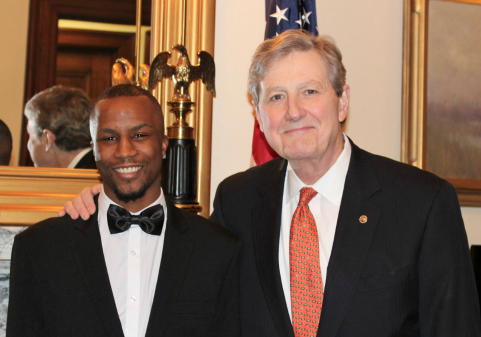 Calvin, a 23-year-old Washington, D.C. native, was hired as a custodian for the U.S. Senate through Goodwill's AbilityOne Program shortly before Kennedy arrived in the chamber in January 2017. The two men quickly struck up a rapport. "When I first started working in this building, he was one of the first ones to stop and talk to me," Franklin told the Washington Post. "I built a bond with him. He's one of the coolest senators." Franklin said that Kennedy asked him to attend the speech as his special guest sometime in early January. "I said yes right away, I'd definitely go with John Kennedy," Franklin said. "That's my buddy." After the speech, Franklin thanked Kennedy on Twitter for inviting him to the State of the Union. Franklin told the Post that, while he likes his job, his dream is to one day become a D.C. firefighter. "I like working up here at the Senate but I'm looking for a better opportunity," he said. "My dream job since I was a kid is to be a fireman but I was scared to try for it because of my learning disability. I need to stop being afraid and jump out there in the real world and do it." This entry was posted in Politics and tagged Louisiana, State of the Union. Bookmark the permalink.